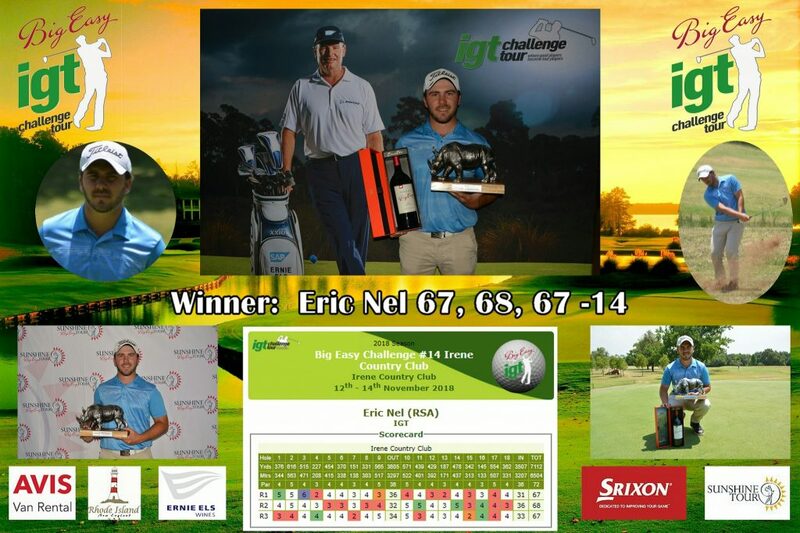 PRETORIA, 14 November 2018 – Pretoria rookie Eric Nel joined the bandwagon of first-time winners on the Big Easy IGT Challenge Tour with a two-shot breakthrough in the 14th event of the season on Wednesday. he 21-year-old Centurion golfer fired a final round five-under-par 67 at Irene Country Club to win on 14-under 202. Nel became the 11th rookie to celebrate success on the golf development collaboration between the Sunshine Tour and IGT Challenge Tour this season. The top 10 ranked players on the Road to Sunshine Tour after the season-ending Big Easy Tour Championship in early December will earn cards for the 2018/2019 Sunshine Tour. Nel started the week in 40th position and about R20 000 outside the top 10, but the maiden win came with a R10.5K pay-day, which boosted him to 16th in the rankings. “The timing couldn’t have been better,” said Nel. “We only had three events left, so it was really do-or-die time for me. I got myself in contention and I had to get it done. Nel shared the 36-hole lead on nine-under with two-time champion Matt Bright after posting earlier rounds of 67 and 68. The pair started the last day with a slender one shot lead, but it took Nel just two holes to take pole position on his own. “I got off to a birdie-birdie start, but I bogeyed four after I got an unlucky bounce,” said Nel, who never relinquished the lead. “I hit my tee shot slightly left. The ball bounced even further left and I couldn’t up-and-down to save par, but I rolled in a 25-footer for birdie at seven to get the shot back. Heading down the back nine, Brown trailed by one shot. Bright birdied 10 to make it a two-way tie for second on 10-under, but both golfers had a brace of double bogeys and faded from contention. Meanwhile Nel picked up another birdie at 11 and eagled the par four 16th. “I drove the green and boxed a six-footer for eagle, but I gave one shot back at 17,” he said. “I was between clubs, and I tried to hit a soft pitching-wedge, but it came out too hard and finished in the hazard. I didn’t worry, because the next hole is another par five. “I hit a good drive at 17, hit the middle of the green with my second and two-putted for birdie to get back to 14-under. I didn’t take any risks at the last hole, just made sure I got myself in the middle of the green for two and two-putted for the win. Woodhill golfer Dylan Kok overcame a double bogey at the par five 10th with four birdies for a 68 to take second on his own, while five-time IGT Challenge Tour winner Tristen Strydom fired nine-birdies for a seven-under 65 to finish third on 11-under with the low round of the day.